Pink Moon Run & Walk 8K is held specifically to raise significant funding for breast cancer research to save lives. Instead of a registration fee, participants are required to raise donations in honor of the 1 in every 8 women who will be diagnosed. Many events that refer to themselves as charity events actually give a tiny percentage of the registration fee or other revenue to a charity. 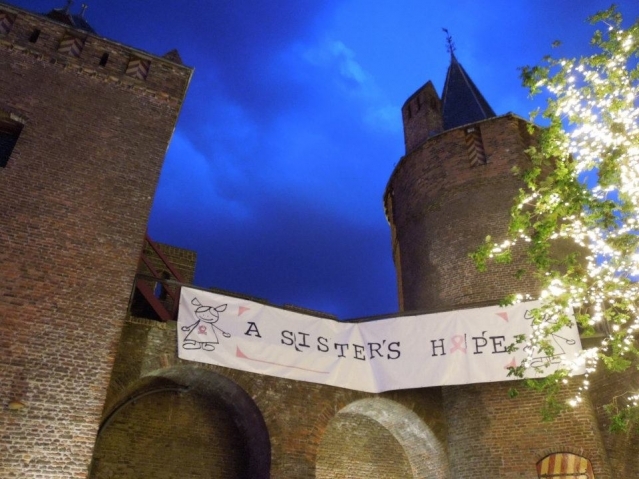 A Sister\'s Hope events, including each Pink Moon Run & Walk, give the maximum amount possible to breast cancer researchers so they can do their vital work. In The Netherlands, events over the past five years have given an average of 85.1% of all donations to researchers. In the United States, more than 99% of all donations have gone to research teams. To fund research is the only reason the events exist. Feel good about where your donations/registration fees are going - where they are needed to find a cure. The route begins and ends at the beautiful and historic Muiderslot castle. Participants choose to run or walk the 8-kilometer distance. A general welcome starts the program at 8 pm in the castle courtyard, followed by an official warm-up and the launch of the walkers at 8:30 pm. Runners are warmed up at 9:15 pm and the closing/awards ceremony begins immediately following the arrival of the last participant off the route. A safety team and pit stop crews are along the 8 kilometers. Hydration is provided at the pit stops along with pink glow sticks to help light the last portion of the journey. The view of the pink-lit castle against a dark blue sky at late dusk provides a gorgeous site as participants wind their way back toward the finish. Prizes are awarded to top 8K male and female runners, and of course to top fund raisers. Nine-year-old Dionne Spaltmann has been among the top three fund raisers the past three years!